This study aimed to investigate whether the combination of tracheal sounds and nasal pressure sensor (TS-NP) allows the same detection of apneas and hypopneas as the recommended American Academy of Sleep Medicine (AASM) method for obstructive sleep apnea (OSA) diagnosis, i.e., the combination of an oronasal thermistor and nasal pressure sensor (Therm-NP). Polysomnographic recordings of 33 patients (6 females; mean age 52.9 ± 10.3 years; mean body mass index, BMI, 30.0 ± 5.2 kg/m2) were analyzed to compare detection of apneas by two different methods of combined airflow signals: a) Therm-NP and b) TS-NP. The two scoring methods were performed randomly and independently of each other. Respiratory event detection results and apnea–hypopnea index (AHI) obtained using Therm-NP signals as a reference were compared to those obtained by TS-NP signals. The number of respiratory events scored using Therm-NP was 7268, while it was 7329 with TS-NP. The sensitivity and positive predictive value of TS-NP with respect to Therm-NP were 93.0 and 90.6, respectively. The average AHI for all patients was 29.8 ± 22.9 for Therm-NP and 30.0 ± 22.6/h for TS-NP. With the Therm-NP as a reference detection, a kappa statistic value of 0.86 for TS-NP revealed a high agreement for classifying OSA into the severity classes mild, moderate, and severe. However, 55% of total events scored by Therm-NP were hypopneas while 59% of events scored by TS-NP were apneas. These results show that TS-NP reliably detects the same number of respiratory events as Therm-NP, despite a difference in the apnea to hypopnea ratio between the two methods. The use of TS does not modify AHI calculations and guarantees accurate sleep apnea diagnosis and severity assessment. Thus, TS can be used as a substitute for an oronasal thermistor in sleep recording systems. This study was performed at Charité Universitätsmedizin Berlin. All authors have read and approved the manuscript. 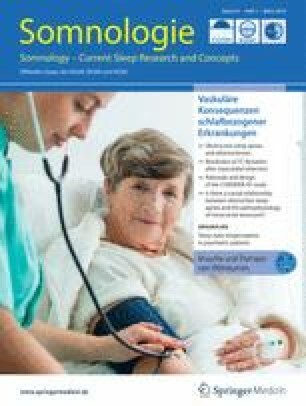 Ziel der vorliegenden Studie war es, zu untersuchen, ob die Kombination aus trachealen Geräuschen und nasalem Staudrucksenor („tracheal sounds and nasal pressure sensor“, TS-NP) gleichermaßen die Erkennung von Apnoen und Hypopnoen ermöglicht wie die empfohlene Methode der American Academy of Sleep Medicine (AASM) zur Diagnose der obstruktiven Schlafapnoe (OSA), d. h. die Kombination eines oronasalem Thermistors mit nasalem Staudrucksensor (Therm-NP). Es wurden die polysomnographischen Aufnahmen von 33 Patienten (6 w.; Durchschnittsalter: 52,9 ± 10,3 Jahre; durchschnittlicher Body Mass Index, BMI: 30,0 ± 5,2 kg/m2) analysiert, um die Erkennung von Apnoen mit den beiden verschiedenen Methoden unter Verwendung einer Kombination mit Luftströmungssignalen zu vergleichen: a) Therm-NP und b) TS-NP. Die beiden Bewertungsmethoden wurden randomisiert und unabhängig voneinander eingesetzt. Dann wurden die Ergebnisse der Erkennung respiratorischer Ereignisse und der Apnoe-Hypopnoe-Index (AHI) unter Verwendung der Therm-NP-Signale als Referenz mit den Ergebnissen unter Einsatz der TS-NP-Signale verglichen. Die Anzahl der ermittelten respiratorischen Ereignisse mittels Therm-NP betrug 7268, mittels TS-NP 7329. Die Sensitivität und der positive prädiktive Wert der TS-NP gegenüber Therm-NP betrug 93,0 bzw. 90,6. Für sämtliche Patienten betrug der durchschnittliche AHI 29,8 ± 22,9 bei Therm-NP und 30,0 ± 22,6/h bei TS-NP. Unter Verwendung von Therm-NP als Referenzerkennungsmethode ergab ein statistischer Kappa-Wert von 0,86 für TS-NP eine hohe Übereinstimmung bei der Einstufung der OSA in leicht-, mittel- und schwergradig. Allerdings waren von allen Ereignissen, die mittels Therm-NP erfasst wurden, 55% Hypopnoen, dagegen waren von den Ereignissen, die mittels TS-NP erfasst wurden, 59% Apnoen. Diese Ergebnisse zeigen, dass sich mittels TS-NP in reliabler Weise die gleiche Anzahl respiratorischer Ereignisse erkennen lässt wie mittels Therm-NP – trotz eines Unterschieds zwischen beiden Methoden hinsichtlich des Verhältnisses von Apnoe zu Hypopnoe. Durch die Verwendung von TS ändert sich die Berechnung des AHI nicht, und es wird damit eine genaue Schlafapnoediagnose und Schweregradbeurteilung gewährleistet. Somit können TS als ein Ersatz für einen oronasalen Thermistor in Schlafdokumentationssystemen verwendet werden. The apnea–hypopnea index (AHI) defines the number of breathing pauses (apneas) and/or partial respiratory flow reductions (hypopneas) that last longer than 10 s per hour of sleep. The AHI is the main criteria used to indicate the severity of obstructive sleep apnea (OSA). Apneas are defined by a pause or at least 90% reduction in airflow and hypopneas are defined by at least 30% reduction in airflow associated with an oxygen desaturation of more than 3% and/or an arousal . The American Academy of Sleep Medicine (AASM) recommends use of an oronasal thermal airflow sensor as the first-choice sensor for detection of apneas and a nasal pressure transducer as the first-choice sensor for hypopnea detection . Oronasal thermal airflow sensors (Therm) use the difference between the temperature of exhaled and ambient air to estimate airflow and detect mouth breathing. The use of temperature as a surrogate for measurement of airflow is an adequate method to detect apneas, because it has the advantage of detecting both nasal and oral airflow. However, while highly sensitive, these sensors only measure airflow indirectly and do not provide quantitative measurements of airflow for detection of hypopneas. Nasal pressure transducers (NP) are sensors capable of detecting pressure changes during inspiration and expiration. This semi-quantitative measurement of airflow pressure gives details on airflow such as the presence of flattening of the inspiratory part of the signal in case of increased upper airway (UA) resistance and also allows better evaluation of hypopneas than thermistors. The combined application of NP and Therm is necessary to detect mouth breathing, ensuring a reliable oronasal flow measurement. In addition, flow derived from respiratory inductive plethysmography (RIP flow) from the thorax and abdominal belt signals has been proposed as an alternative signal for scoring apneas and hypopneas if the thermistor signal fails or is unreliable . However, the use of RIP flow in combination with NP has its limitations. For instance, mouth breathing or misplacement of nasal cannula may lead to the absence of respiratory event detection. To overcome these limitations, several systems have been proposed that use tracheal sounds (TS) for OSA diagnosis [2, 3, 4, 5, 6]. TS signals correlate well with respiratory flow, with no significant difference in the number of apneas detected with TS or reference sensors [4, 6, 7, 8, 9]. Tracheal sounds, recorded at the sternal notch, reflect the superficial vibrations of the body set in motion by pressure fluctuations [10, 11]. Placed on the sternal notch, the TS sensors can detect these vibrations and thus measure tracheal flow sound as well as snoring. Our study aimed to evaluate the combination of TS and NP sensors for respiratory event detection and evaluation of apneas and hypopneas. The results were compared to those obtained with the recommended combination of thermistor and nasal pressure sensors. Patients with clinical suspicion of OSA scheduled for routine diagnostic polysomnography (PSG) were asked for their participation in the study on a consecutive basis. All patients signed a written consent and the study was approved by the local Ethics Committee (application number: EA1/009/13) of the university hospital, Charité Universitätsmedizin Berlin. Inclusion criteria were: age between 18 and 70 years, a minimum recording of 6 h, and an AHI greater than 10/h. Patients with any sleep disorder other than OSA, with clinically unstable respiratory or cardiovascular disease, with excessive alcohol consumption or any kind of drug or medication that could influence sleep were excluded from the study. Age, height, and weight as well as medication and diagnoses of the patients were recorded. In addition to PSG using the Embla N7000 system (Embla Inc., Broomfield, CO, USA), a polygraph CID102L equipped with the PneaVoX® TS sensor (CIDELEC, St. Gemmes sur Loire, France) was used. Recorded data included electrophysiological signals for sleep evaluation as well as recording of airflow by NP and Therm, body position, actigraphy, RIP thoracic and abdominal movements, and pulse oximetry (SpO2). The PneaVox® sensor was taped on the skin just above the suprasternal notch and then secured in place using an adhesive bandage. Correct positioning of the transducer is an essential element to assure the high-quality of the signal. For adequate synchronization of the Embla and the CID102L recordings, the nasal pressure signal was connected to both systems using a T-adapter. Recordings were monitored, and the quality of all signals was checked throughout the night. Each PSG recording was scored manually by an experienced medical technician at the Charité Sleep Medical Center according to the AASM criteria . All respiratory signals from the Embla system were imported into the CIDELEC system in European Data Format (EDF) and a new anonymized polygraph file was created for each patient. The TS sensor, PneaVoX®, is similar to a stethoscope with an imbedded combination of a pressure sensor and an acoustic sensor. While the pressure sensor could be used for characterization of respiratory events , the acoustic sensor measures sound variations induced by: 1) high-pitch respiratory flow sounds with an acoustic intensity less than 76 decibels and a frequency between 200 and 2000 Hz; 2) low-pitch snoring sounds with an acoustic intensity greater than 76 decibels in the transducer chamber and a frequency between 20 and 200 Hz. Fig. 1 illustrates the process from the acquisition of the tracheal sound raw acoustic signal to the extracted analyzed respiratory flow sound and snoring signals. The synchronized recordings were independently scored for apneas and hypopneas using two different methods: 1) the TS-NP combination and 2) the Therm-NP combination. Analysis of the two methods was performed in a random order. The two scorings of respiratory events were then compared. AHI was based only on respiratory channels using validated total recording time (TRT) instead of total sleep time (TST). Only hypopneas with ≥3% arterial oxygen desaturation were included in AHI evaluation. The AHI was calculated for each method and the two values were compared for each patient. Statistical analysis was performed using IBM SPSS Statistics v.24.0 (IBM, Armonk, NY, USA). Values are presented as mean ± standard deviation (SD). The correlation between scoring results based on TS-NP and Therm-NP was assessed by calculation of Pearson’s two-tailed coefficient. The Cohen’s kappa, sensitivity, and positive predictive value (PPV) for event detection were calculated for all patients using the Therm-NP signal combination as a reference. 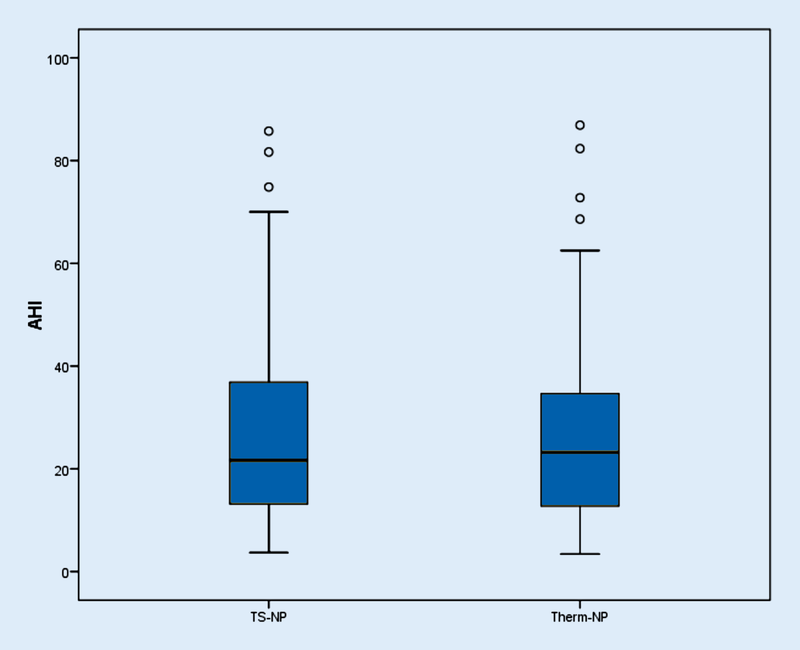 In addition, Bland–Altman analysis was performed for visual analysis of agreement between TS-NP and Therm-NP based on AHI scoring. The patient group consisted of 33 subjects (6 women, 27 men) with a mean age of 52.9 ± 10.3 years and a mean body mass index (BMI) of 30.0 ± 5.2 kg/m2. Twenty-one patients had concomitant diseases including one or more of the following: hypertension (n = 9), cardiac arrhythmia (n = 2), chronic obstructive pulmonary disease (COPD; n = 2), asthma (n = 2), respiratory failure (n = 1), obesity (n = 4), hypercholesterolemia (n = 3), diabetes (n = 1), and hypothyroidism (n = 1). The mean AHI based on TST from PSG (AHI-PSG) was 34.1 ± 24.2 events/h with an apnea index (AI-PSG) of 18.9 ± 25.2 events/h. Nineteen patients had mild-to-moderate OSA (5 ≤ AHI < 30/h) and 14 patients had severe OSA (AHI ≥ 30/h). The mean time in bed (TIB) was 470.1 ± 51.8 min and the sleep efficiency (SE) was 81.7 ± 11.0%. The total number of events detected using sensor combination TS-NP was 7329 (4344 apneas and 2985 hypopneas). 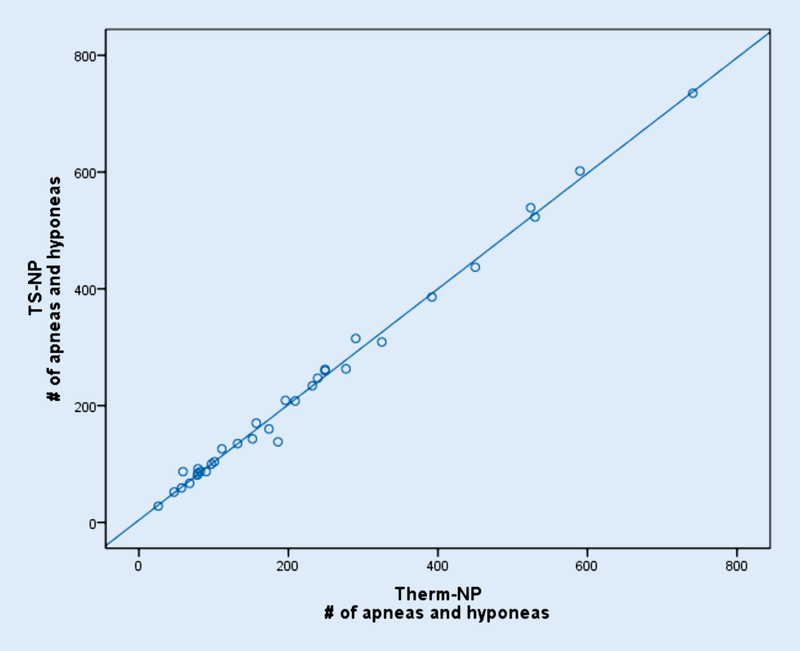 Using the Therm-NP combination, 7268 events (3251 apneas and 4017 hypopneas) were detected. With the Therm-NP as reference detection, the sensitivity for TS-NP was 93.0% (95% confidence interval 90.8 to 95.1%) and the PPV was 90.6 (95% confidence interval 87.6 to 93.7%). Correlation analysis for apnea and hypopnea detection using the two different sensor combinations revealed a strong positive correlation (r = 0.997, N = 33, p < 0.001) between NS-NP and Therm-NP (Fig. 2). The mean AHI based on TRT validation using the synchronized recordings was 30.0 ± 22.6 events/h using TS-NP and 29.8 ± 22.9 events/h using Therm-NP (Fig. 3). With the Therm-NP as a reference detection, a kappa statistic value of 0.86 (standard error 0.08) for TS-NP revealed a high agreement for classifying OSA into the severity classes mild (5 ≤ AHI < 15/h), moderate (15 ≤ AHI < 30/h), and severe (AHI ≥ 30/h). Using TS-NP, misclassification by one severity class was observed in 3 patients (Table 1). There was a difference in AHI of more than 10% between the two methods in 4 patients. Fig. 4 displays the results of the Bland–Altman analysis for apnea and hypopnea detection using the Therm-NP sensor combination as the reference. The mean difference value of the number of detected apneas and hypopneas between the Therm-NP and the TS-NP was small, with −1.8 event difference and agreement limits between −27.7 and 25.4 events. This study is the first to investigate the use of tracheal sounds in combination with nasal pressure transducer flow signals for AHI calculation in adult patients with OSA. Results were compared to those obtained with the AASM-recommended use of oronasal thermal airflow in combination with nasal pressure transducer flow signals. Overall, the use of combined TS-NP signals provided a highly accurate evaluation of OSA severity, categorizing patients correctly into severity groups as mild, moderate, or severe. Moreover, results for AHI calculation were not statistically different between the two methods. Under the assumption that the TS sensor is placed correctly on the sternal notch, its use in combination with NP provides a new method for correct identification of respiratory events in patients with OSA. In total, 7329 apnea and hypopnea events were detected using the combined TS-NP signals. The number of events detected was only 0.8% more than that found by the Therm-NP reference scoring. In addition, the ranges of the number of apnea and hypopnea events detected were very comparable, with values ranging from 28 to 735 events for TS-NP and from 26 to 741 events for Therm-NP. The sensitivity of TS-NP (93.0%) for event detection was good, with slightly lower PPV values (90.6%). These results are also confirmed by the Bland–Altman plot (Fig. 4), illustrating that the patient-to-patient variability of differences was small. 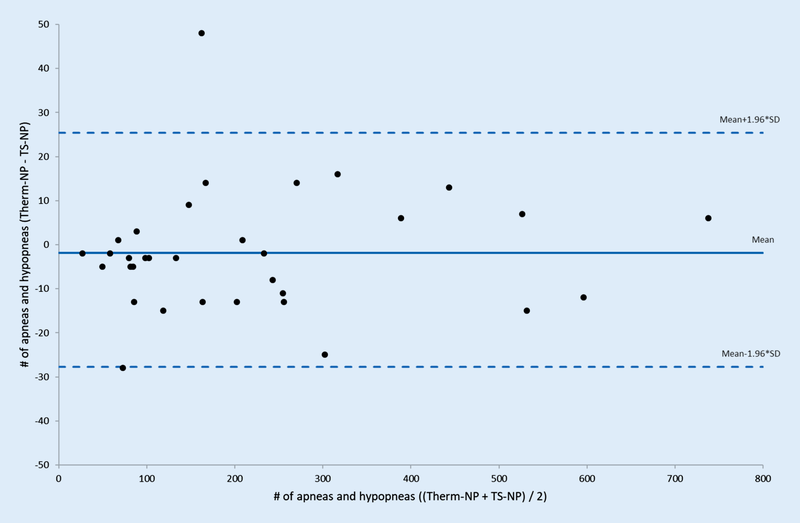 There was only one single subject in whom the difference between methods was 48 events, due to higher number of hypopneas scored by the sensor combination Therm-NP. Good agreement between methods is also mirrored by the fact that 30 (91%) OSA patients were correctly classified according to severity classes; however, compared to Therm-NP, TS-NP classified one patient with mild OSA as moderate, one with moderate OSA as severe, and one patient with moderate OSA as mild (Table 1). In our study, the AASM respiratory rules for adults  were used as reference. These recommend use of an oronasal thermal airflow sensor for apnea detection and the use of a nasal pressure transducer for hypopnea detection as the first choices for flow measurements. In our study, we used a thermistor attached to the nose and mouth as well as a nasal cannula. Results of reference scoring with the Therm-NP sensor combination revealed an event distribution with 45% apneas and 55% hypopneas. Using the sensor combination TS-NP, more apneas (59%) than hypopneas (41%) were scored. One explanation for the lower apnea scoring rate of Therm-NP could be attributed to the fact that in certain cases, reduced flow rates of ≥90% compared to pre-event did not result in amplitude reductions of ≥90% of the Therm signal, and were therefore scored as hypopneas rather than an apneas. The tendency of thermistor sensors to underestimate reduced flow rates together with a non-linear signal characteristic has already been reported in the past  and mentioned by the AASM . In a recent study , we showed that the TS signal detected more apneas compared to the Therm signal. On the other hand, the TS may indeed overestimate the number of detected apneas. In some cases of respiratory events, the TS sensor was not able to sense residual flow rates with amplitude reductions less than 90% and therefore classified them as apnea rather than hypopnea. One can speculate that there are anthropometric and other factors influencing the sensitivity of TS for sensing low flow rates such as height, neck circumference, or BMI. For instance, the Bland–Altman plot in Fig. 4 illustrates that there are two subjects with 25/28 less events scored using the Therm-NP sensor combination compared to TS-NP, and these were obese patients. However, due to the design of this study, this issue could not be systematically analyzed and remains a question to investigate in future trials. In order to investigate these issues in detail and to quantify absolute flow rates, one has to perform gold standard recordings with a pneumotachograph (PNT). In a previous study with a prototype of the TS sensor PneaVoX®, a parallel recording with a PNT revealed no difference in the number of detected apneas . A limitation of our study is that we did not measure flow with a PNT. Future studies with the TS sensor should include this measurement in order to confirm the nature of the detected events. The current study shows that the combination of tracheal sound and nasal pressure sensors reliably detects the same number of respiratory events as the combination of thermistor and nasal pressure sensors, despite the difference in apnea to hypopnea ratio between the two methods. The use of tracheal sound does not modify AHI calculations and guarantees accurate sleep apnea diagnosis and severity assessment. Furthermore, the tracheal sound sensor used in this study is practical, easy to put in place, and well tolerated by patients. It does not disturb sleep and is less likely to move or be displaced during sleep than thermistors. Thus, tracheal sound sensors can be used as a substitute for oronasal thermistors in sleep recording systems. However, prospective evaluation in a larger group of patients with a PNT flow measurement is needed to confirm the clinical value of this approach. The authors gratefully acknowledge Emmanuelle Emo for her support in study coordination as well as Claudia Biro and Beate Diecker for scoring of sleep recordings. The study was financially supported by an unrestricted grant from CIDELEC, France. A. Sabil was fully employed by CIDELEC at the time of study. Guillaume Baffet is currently employed by CIDELEC. T. Penzel has received research grants from Heinen & Löwenstein, Itamar, Philips/Respironics, Resmed, Somnodent. He has received speaker fees and travel support from Bayer, Itamar, Inspire, Somnodent, UCB, Weinmann. He is a shareholder of Advanced Sleep Research GmbH, The Siestagroup GmbH, Somnico GmbH. He was supported by the project no. LQ1605 from the National Program of Sustainability II (MEYS CR) and by the project FNUSA-ICRC no. CZ.1.05/1.1.00/02.0123 (OP VaVpI). Ingo Fietze has received research grants from Actelion, Eisai, Heinen & Löwenstein, Jazz Pharmaceuticals, Philips/Respironics, Resmed, Somnodent, UCB, Vanda. M. Glos, K.S. Jelavic, G. Baffet, C. Schöbel, and I. Fietze declare that they have no competing interests. The authors alone are responsible for the content and writing of the paper. All procedures performed in studies involving human participants were in accordance with the ethical standards of the institutional and/or national research committee (Charité-Universitätsmedizin Berlin, application number: EA1/009/13) and with the 1964 Helsinki declaration and its later amendments or comparable ethical standards. Informed consent was obtained from all individual participants included in the study.